So friends, why we are here, I mean to this semiconductor industry. Obviously to make a lot of money, so lets talk about the industry in general, that how important we are, what we do, and how we can make money from this industry, First I would like to tell you some fact about this industry that how big actually this semiconductor industry is, means how much cost of computer chips resell each year, this is approximately 300 billion dollars, this records is according to the year 2010 but today is 2013, so that numbers must be higher, that is our gole, if we talking about the EDA industry then that is about 5.3 billion dollars, The interesting thing is that none of the computer chip and electronic chip will be exist without this EDA industry. Now the market drivers, that means to the selling of electronic chip to consumer, The most important thing about the market driver is time to market, that means you have to move the products to the market on time, this is because we generally knows this term that there are some occasions when the demands is high for example many of us plans to purchase a computer system or any other electronic gadgets on Diwali or other festivals, so at that peak time if company is not delivers the products, that reduces the profit, now another critical aspect which effect the vlsi industry is global competition, the chip industry or semiconductor industry was mainly based on US market, few years back Japanese said that they produce the electronic chip cheaper, faster and better quality, and they really affects the US semiconductor market, The US developer says ohhh we don't want to loose the semiconductor market, and takes some major steps. 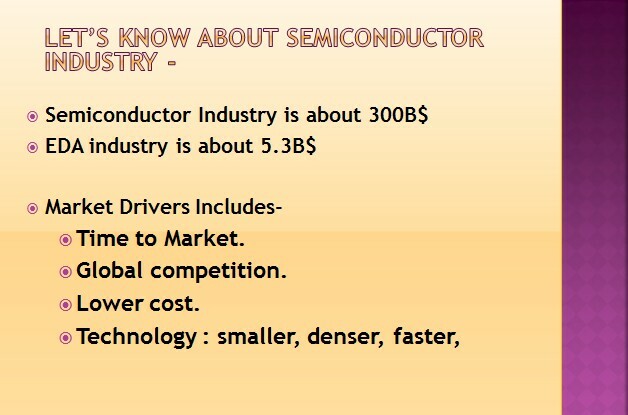 But interesting thing is that, now the semiconductor or chip industry is approximately all over the world. primarily in twain. This was quite interesting. And other aspects are the technology which is use to make chips smaller, faster denser, and lower cost and better quality. Because if you remember the early cell phones they are bigger at 10000Rs, but today you will get these cell phones in 500Rs only, so the cost is lower and lower, and size of systems is also reduces, and it's now smaller, smaller and smaller, so I must say that this technology is very interesting, dynamic, and challenging.